Recently, Daniel’s Beaver Scouts went on a camping trip. 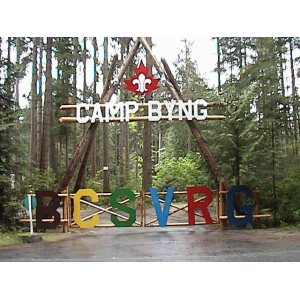 At Camp Byng the children and parents were to share digs in the main lodge. Nice… an actual mattress, not a roll-up foamy to sleep on or a tent/tarp to sleep under. Heated AND out of the elements. Lovely. All for $10 plus the cost of the ferry and gas. So, after the official camp-opening ceremony, it was a free-for-all to find somewhere to sleep. All the parents scrambled to find a bunk in one of several rooms. There was almost a bed for everybody, shy by just two. Musical chairs had taken on a new spin – musical beds. Seriously, it was quite a scramble. The last two peole had to lay a couple of mattresses on the floor of one of the larger rooms. After the campfire, investiture ceremony and mug of hot chocolate, people started getting ready for bed. As the children climbed into their sleeping bags in the bunks above, I was able to figure out who the other adults were that were going to be sleeping nearby. Clockwise around the room: Tony, Me, Larry, Michelle, Carolyn’s Dad, Ethan’s Dad, Isaac’s Dad and Darlene. So, it seems I’ll be sleeping between Tony and Larry, with absolutely nothing but our sleeping bags between Larry and Me. Interesting. I changed into my pink penguin fleecy pajamas (sorry, but they were the most presentable/modest in my drawer) in the bathroom and hopped into my sleeping bag with a crime novel to keep me occupied. Eventually the lights were turned off. People began drifting off to sleep. Except me. Even with my earplugs firmly squashed into my ears I couldn’t sleep. Neither Tony nor Larry had turned in for the night. I pretended to be asleep when they finally came into the room at about 1:30am. They didn’t leave the room to get into their jammies, so I assume that they either slept in their clothes or changed in the room. I remained motionless with my eyes closed while they climbed into bed. Weird. That’s how it felt. Very weird. So I lay there in the dark with my eyes closed waiting for morning to come. After a while I removed my earplugs. KZZZZZKKKAAAAKAKKK, SCHAAAAAAAAAAAAACK, HAAAAAAAKKKKKKZZZZZZZ… Dear Lord, I was sharing a room with a few bears. Well, either bears, a chainsaw testing facility or a bunch of freight trains. Daniel, being extremely sensitive to snoring, had climbed down the ladder and was asking for some earplugs. Extremely frustrated by the racket, he was almost in tears. Shortly, after digging around in my duffel bag for another pair of earplugs, I had him settled back into his sleeping bag. After a minute or two he fell back asleep. I popped my earplugs back in. As the foam expanded, the room’s din faded… to… nothing. Peace and quiet again. Aah. Why couldn’t I fall asleep? I knew I just needed to relax; thinking about not sleeping just gets me worrying and fretting. Not helpful at all. I think I finally dozed off at around 3:30am. This entry was posted in Beavers and tagged Beavers, Camp Byng, Daniel, sleep deprivation, tired, travelling. Bookmark the permalink.